Added to the State Parks in 1988, Ripley Desert Woodland is located a few miles west of the Poppy Reserve on Lancaster Road at 210th Street West. Donated to the State by Arthur "Archie" Ripley, the park protects and preserves an impressive stand of native Joshuas and junipers which once grew in great abundance throughout the valley. Today, only remnant parcels of this majestic woodland community remain in the valley, the rest having been cleared for farming and housing. 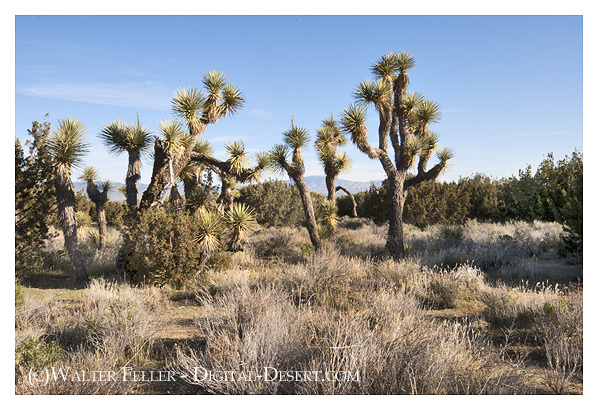 The Joshua tree played an important part in cultural history of Antelope Valley, providing a vital source of food and fiber materials for the Native Americans that inhabited the region. The naming of Joshua as a "tree" is credited to early Mormon settlers who saw the tree with its upraised arms as Joshua leading the Israelites into the Promised Land. Its actual classification, however, is as a member of the lily family. In early spring months, creamy white blossoms begin to grow on the ends of the branches of the Joshua. The blooms last for several months, growing larger and larger as the weeks go by. Set in a bed of wildflowers, the Joshua becomes a site of stately beauty. We invite you to walk through this majestic Joshua woodland, to enjoy its beauty and to share with others the importance of preserving this valuable resource.